Imaging Resource (established April 1998) is a website with digital cameras reviews and digital camera comparison images. 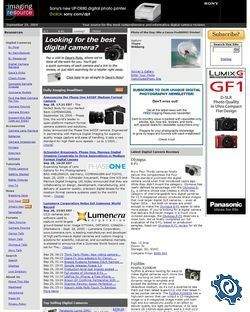 The website has comprehensive reviews of digital cameras, Dave's Picks buying guides (named after the owner, Dave Etchells), and an exclusive image comparison database. The website also has a large database with detailed information about individual digital cameras and a feature that allows comparison of the digital cameras to each other. This page was last modified on 4 October 2009, at 22:41.